The following article was written the night of April 20. On Monday morning, April 20, the Jewish world was stunned and saddened to learn of the death of Rabbi Aharon Lichtenstein at age 81. Rav Lichtenstein came to Israel’s first hesder yeshiva (where students combine Torah study and military training), Yeshivat Har Etzion in Alon Shvut, where he shared rosh yeshiva duties with Rav Yehuda Amital and held the position from 1970 until he was forced by poor health to scale back some of his duties in recent years. Rav Lichtenstein was born in Paris in 1933. In 1940 his family fled France and immigrated to the United States. Attending Yeshiva University in New York, he studied under Rabbi Joseph Soloveitchik, who became his mentor and his father-in-law. He had the reputation as a pioneering and brilliant Talmudist and was awarded the Israel Prize, the nation’s highest honor. This past week has seen an outpouring of memories and grief from those who knew him, knew of him, studied with or under him, or knew him by reputation. Atlanta is no exception. I spoke with many who wanted to express their sorrow and their admiration for this great man. Their thoughts will express his character and intellectual brilliance as nothing I could write would. Some were willing to be quoted by name, while some wanted to reminisce anonymously. Josh Weissmann, an outstanding recent Yeshiva Atlanta graduate, is studying at Gush. I asked him if, in the sadness of the moment, he would share his thoughts with me. “I used to watch him, day after day, race into the beit midrash on his walker, learning for hours at a time, even at age 81 — an inspiration from afar that stagnation should never lead to satisfaction,” Weissmann said. 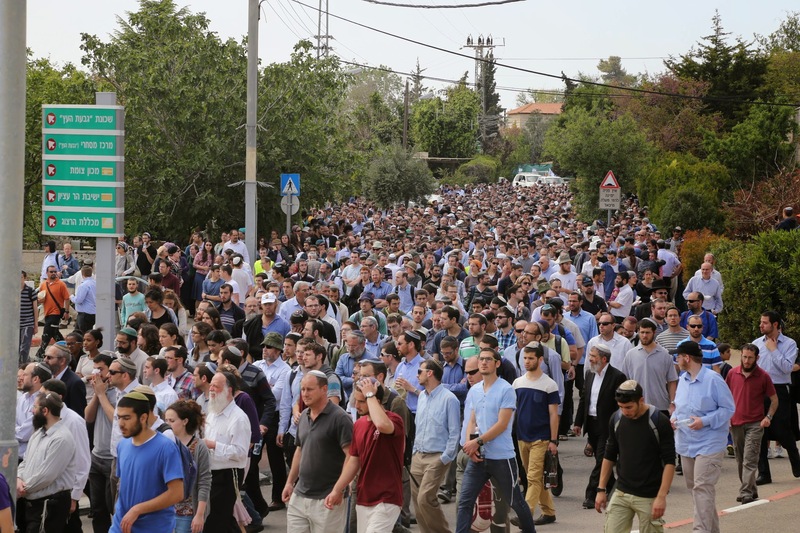 “And now in his passing I witness tens of thousands of talmidim and millions of tears from his closest students, who gather at once for his burial. They say his strongest trait, amongst a complex and quiet personality so staunchly devoted to G-d and Jewish tradition, was his humility. That even after reinventing the concept of religious Zionism in Israel by resurfacing an entire Hesder Yeshiva movement his name remains absent from the discussion is only testimony to his ability to silently shape today’s leadership seemingly across the board in the Modern Orthodoxy, Dati Le’umi and general Israeli culture. On Monday night, April 20, Young Israel of Toco Hills synagogue hosted an azkarah, or memorial service, for Rav Lichtenstein at which several former students and one current teaching colleague spoke about their friend and mentor. First to speak was Emory professor Rabbi Michael Berger. As a Gush student, he was a close student of Rav Lichtenstein’s. He told the audience that Rav Lichtenstein had a passionate pursuit of the world that was complex and that he had an incredibly analytic mind and was thus able to see many valid sides. Rabbi Berger said Rav Lichtenstein’s approach to his students was that “he didn’t want to clone himself through the students. Rather, he wanted to launch his students.” And he did — by pushing them to go into the rabbinate, chaplaincy, chinuk. Rav Lichtenstein supported a pro-land-for-peace religious movement. Rabbi Levy said he’d vote for a party because it was “the least worst party.” He believed that “it is a greater mitzvah to live in less populated areas — the Gush better than Tel Aviv, for example. Peace between humans was more important than a piece of land was his belief in the ’80s.” Eventually he was disappointed by the political parties. Another example: Rav Lichtenstein would always stop on the road to help people change their tires. He’d help carry his passengers’ luggage. He was extremely modest and totally honest. He made an effort to understand the strengths and weaknesses of others. He didn’t force his views on others; rather, he let them express themselves, knowing that would produce incredible results. Rabbi Starr closed the program by listing some of the rav’s outstanding traits. He was a towering intellect. He was a moral compass for all around him. He was an exemplar of humility and modesty. He was the pre-eminent leader of Modern Orthodoxy within the Orthodox spectrum. And he had such love and caring for his students, just as they had such love for him. 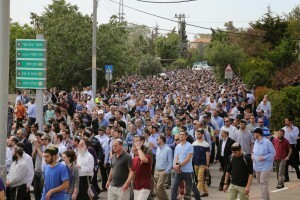 As I write this, I’m also watching and listening to the live streaming of the levaya (funeral) at Gush. I don’t think there is a dry eye in the place. I really wish I understood Hebrew, though no language barrier can bar feeling the pain and sorrow in that room filled with students, teachers, men and women alike, some in military uniforms. The outpouring of love, respect and loss expressed in salty tears is palpable.